Visitors to the new Mobile Retail Showcase in the Boston headquarters of Digitas might for a moment feel like they have stumbled into a local wireless store. 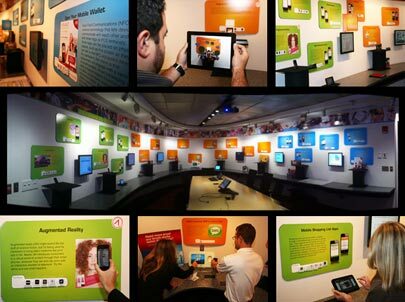 The room features displays for the iPhone and Android smartphones and tablets as well as informational boards and hands-on demos of technologies like QR codes, Augmented Reality, barcode scanners and NFC (Near Field Communication). The idea behind the effort is to help clients make the connection between mobile and brick-and-mortar retail and understand how the medium will impact engagement with brands. “Here, we have collected a number of key mobile technologies that transform retail into one place where internal teams and clients can get 'hands on’ with the technologies and learn about how they could be applied to solve real marketing challenges. We want to bring trends and new advancements directly to our clients,” said Chia Chen, SVP, mobile marketing practice lead for Digitas, in ablog post about the initiative. Marketers will be able to use the showcase to get up to speed on how mobile coupons work, new technologies affecting retail, and the latest mobile hardware and software. The demonstrations show how consumers are using devices to enhance their shopping experience. “Empowered by always on connectivity, shoppers are getting product information, user reviews, pricing and checking for discounts -– as they are standing in front of the merchandise,” said Chen. The Digitas executive said in an interview that while clients often have firsthand experience with mobile shopping, they haven’t necessarily had an opportunity to explore the full range of m-commerce-related technologies in one place. During a walk-through of the mobile center at a soft launch held last month, Digitas clients wound up touching every device in sight.